They may not be Metallica, Slayer or Anthrax, but Hirax are nevertheless one of the early thrash pioneers, founded in the Bay Area in 1984 at the same time when bands like Exodus and Overkill started out, more successfully, of course. 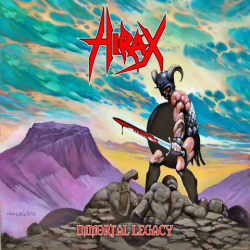 Katon W. DePena is the only remaining member from the original line-up, but his three energetic co-musicians do their very best to make the fifth Hirax album Immortal Legacy sound exactly like what you would expect from a classic thrash record. Five albums in thirty years may not sound like much, but there were a lot of breaks, and the band prefers being on stage to recording in a studio. The album starts right away with its most brutal track Black Smoke. This is thrash metal that takes no prisoners, and the relentless guitar playing allows parallels to Slayer. The following material is still fast and gripping, but slightly less extreme, reminding rather of bands like Overkill and Exodus. The very charismatic vocals switch skilfully between aggression and melodies, adding to the authenticity of the album. Less interesting are the three guitar and bass solo pieces whose sole reason of existence may be to show off the brothers Lance and Steve Harrison’s skills, but I do prefer the regular vocal tracks. It’s hard to pick out favourites as the album is maintaining a constant high level. Tradition wants that the last track on any Hirax album should be something different. In this case, The World Will Burn has a power metal touch and allows comparisons to Omen. Immortal Legacy also features some guest musicians: Jim Durkin (Dark Angel), Juan Garcia (Agent Steel) and Rocky George (Suicidal Tendencies, Fishbone) added some guitar parts. Those of you who grew up in the Eighties with the early thrash metal should be awash in nostalgic feelings with Immortal Legacy. Fans of traditional thrash metal can’t do anything wrong here, as Hirax put all the right energies into songwriting and performance. A higher rating would have been possible with a slightly longer running time.